In this series of upcoming blog posts, I will be talking about the key improvements to the latest version of FlowSight. I will start with geometry list improvements, open volume and void isosurface visualization developments, and new 3D-clipping features. In addition to geometry components, geometry types like baffles, sampling volumes, and probes form an important part of many simulations. FlowSight can now display more geometry types allowing the user a more clear connection between geometry setup and results analysis. This connection is important as it helps the user understand how a certain geometry type, for instance a solid baffle, has affected the overall results in the simulation. Another example is a probe, which is passive in the sense that it does not the change the simulation results, and only collects data. But, it is informative to visualize a probe during postprocessing to give the user a thorough insight about the location of the probe in the simulation. A geometry subtype is only shown in the list, if geometry belonging to this subtype exists in the simulation. 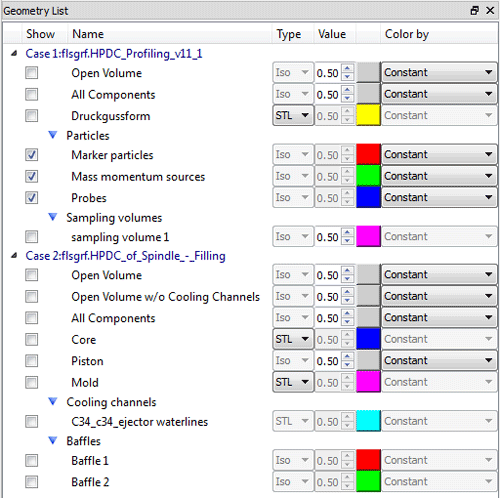 The screenshot below shows a geometry list of possible geometry types for an example case. Notice that baffles can be seen at the bottom of the list. For the benefit of our die casting customers, FlowSight now allows users to hide cooling channels with an option to draw Open volume without cooling channels. Open volume is basically any region in the computational domain without solid. 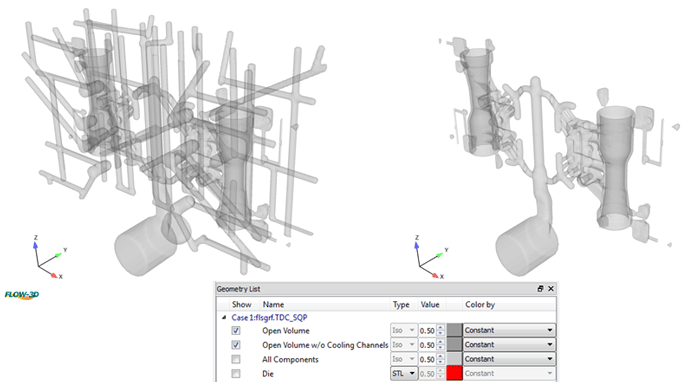 This feature enables the user to view the casting geometry without having cooling channels in the way. The 3D clipping tool allows users to slice an isosurface in all six directions simultaneously. This is very useful for finding areas of interest, such as porosity-related defects, or visualizing output such as temperature, pressure, or velocity profiles inside the domain. 3D clipping is currently allowed with a Cartesian mesh only. 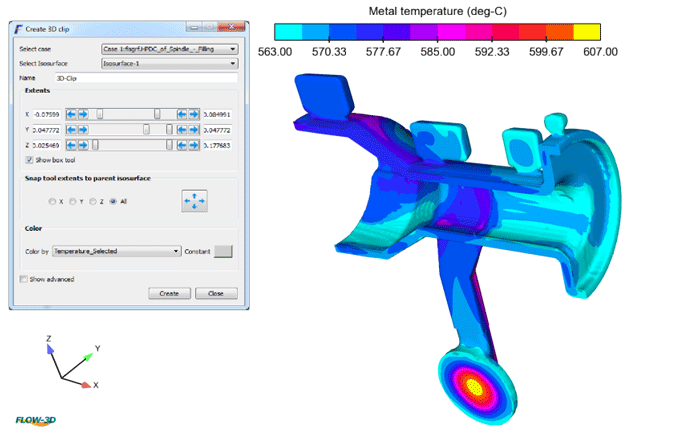 The image above shows a high pressure die casting (HPDC) simulation. A 3D clip can be animated between the given extents in a particular direction. The user can swap 3D clips in one of the X, Y or Z directions at a time. Animations can be played forward/backward once or in a loop mode. These options can be accessed from the loop control combo box. A saved 3D clip animation is shown in the video below. The left half of the animation plots temperature isosurface and the right half plots entrained air fraction isosurface. The rates of animation in the two halves have been set differently, causing the left half animation to take longer to go through the geometry, compared to the right half. The rate is governed by the number of steps shown in the loop control combo box above. The new developments in FlowSight described here provide users with a better connection between the simulation and post-processing, particularly in relation to visualizing the geometry features such as baffles, probes, and sampling volumes. In the upcoming blog posts, more new features of the latest version of FlowSight will be discussed.